10 Hacks on how to reuse your wedding lehenga! A bridal lehenga is a big deal. You put your heart and soul into your wedding lehenga and end up wearing it only once! After selling your kidney for your bridal lehenga, don’t you think you should think of ways to reuse your wedding lehenga? After all, paise (and kidney) jhaad pe nahi ugte! Many brides that my team met would often ask us if there are any really cool ways to reuse wedding lehenga. As life is not an Ekta Kapoor soap, you can’t wear your bridal attire every other day, but you can wear your wedding lehenga again but in different styles! 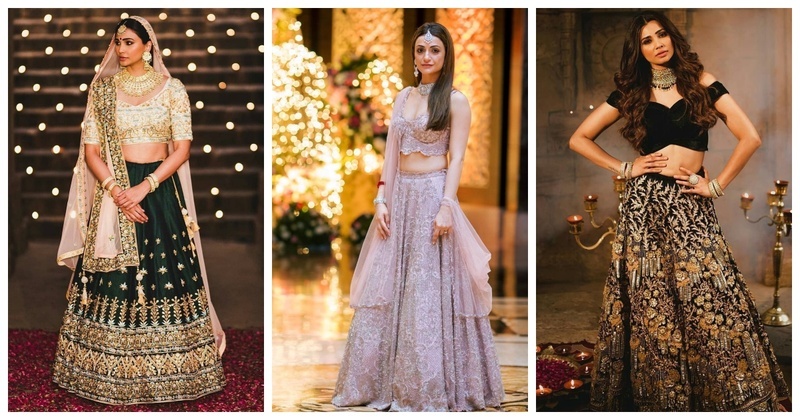 The WZ Cheap Nut (AKA Neharika Advani), found 10 cool ways of how to reuse your wedding lehenga and wear it multiple times! Scroll down to see some quirky jugaads on how to reuse wedding lehenga! Your heavy dupatta with all that zardosi work can easily be stitched into a kurta which you can wear to any function you wish. Hand it over to your darzee and your work is done! The blouse or choli that you wore with your lehenga can be alternatively worn with a plain skirt or saree. Whatever rocks your boat! You can completely transform your wedding lehenga. Singer Vidya Vox turned her mother’s saree into co-ords and it looks fab! With a swish and a flick you shall transfigure your wedding lehenga into anything you like! Such a clever way to reuse the bridal lehenga! The wedding lehenga can be reused by simply putting a long jacket. Fin! Lehengas usually have a lot of gher or flair in them. If you have plans to wear your wedding lehenga again, a good idea would be to tone it down a little. This way you won’t look like a bride again or worse, a pseudo bride! Your married life will encounter many occasions where you need to doll up. Like karva chauth and first diwali. Reuse the wedding lehenga in a unique way and compliments will come you way! The entire crew of Bole Chudiyan seemed to be getting married that very day so why should you look any less on Karva Chauth? Unpopular opinion, but a shirt paired with lehenga looks fabulous! You can wear this combination at a casual Diwali party at your friend’s house! What a stylish way to reuse your wedding lehenga! You can wear your wedding lehenga again at your sibling/cousin’s wedding but this time as a half saree! Pro tip- use another dupatta for the half saree. This will give it a fresh look! Also another way of reusing your old lehenga is to mix and match totally different outfits to create a vivid contrast. Just make sure not go over-the-top flashy. Thoda dard hoga..but you need to move on! Move on from your lehenga and turn it into an anarkali. This was you can wear the wedding lehenga again and again! If you have any better and unique ways to reuse your wedding lehenga, let us know in the comment section!